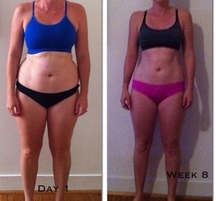 I started out doing the 14 week programme without expecting too much from it, but was so surprised with the changes in a short time that I just had to sign up with the 8 week programme. I had a pacemaker fitted late last year and was really bummed out about a lot of things in my life. I ate and had a couple of beers to many to ‘make myself feel better’ but always ended up feeling worse. After being cleared by my doctor to get stuck into exercise, I signed up to make positive changes. My attitudes to life, health and motherhood have shifted from predominantly negative to predominantly positive. I was reluctant to share in the Facebook group as I’m not a FB poster much at all. Within a week or so, I found it so reassuring that the struggles I was having with exercise, temptation and attitude were normal and all the other women in the group understood and encouraged me whenever I felt low. Now, my health is greatly improved, and my attitude to food, fitness and myself are all a lot more positive. I still don’t like the housework, but it’s not so much of a struggle when you’re physically more able PLUS you have stopped chanting in your head, “I hate this”, as you go. Changed mindset. And a bonus, I fit back into all those old clothes that I was starting to think I never would. If you don’t think you can do it: You can. Absolutely. I haven’t met a weak woman yet, you are strong. Help yourself find that strength to make your life and health better. Mindset, hydration, nutrition, fitness. 🙂 Busy mums can do anything. I enjoyed the great healthy food, tasty recipes that have become family favorites. Click here for more motivational and posts.